WASHINGTON – The members of the Office of Strategic Services (OSS) received a Congressional Gold Medal today during a ceremony in Emancipation Hall of the U.S. Capitol. The medal, conferred collectively, recognizes the members of the OSS for their superior service and major contributions during World War II. 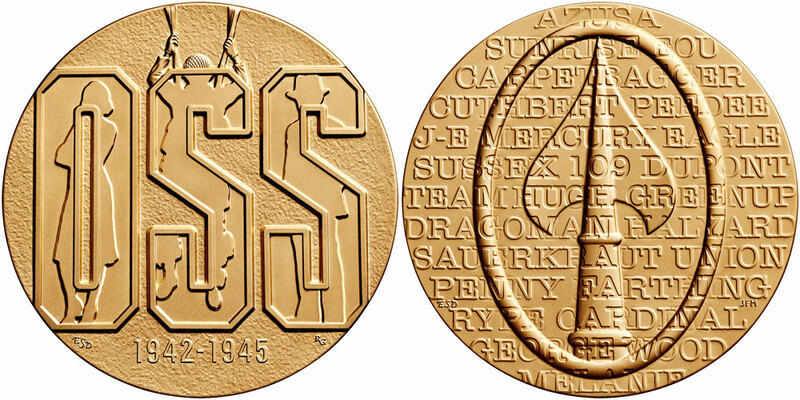 The United States Mint sculpted and manufactured the Office of Strategic Services Congressional Gold Medal. Its obverse (heads) features the inscription “OSS” revealing three figures – a woman, a paratrooper, and a man in a suit – that represent the broad range of work undertaken by the OSS. Each figure is rendered as a shape without details, hinting at the way OSS agents sought to operate anonymously. The diversity in the OSS is also reflected by the figures, conveying that OSS members were men and women, civilian and military. The design also features the dates “1942-1945,” the years during which the OSS operated. United States Mint Artistic Infusion Program (AIP) artist Emily Damstra created the design, which United States Mint Sculptor-Engraver Renata Gordon sculpted. The public law that awards the Congressional Gold Medal to the OSS also authorizes the United States Mint to strike and sell bronze reproductions of the medal. The three-inch medal (18MB), priced at $39.95, and the 1.5-inch medal (18MA), priced at $6.95, will be available for purchase on March 21, 2018, at 3 p.m. Eastern Time through the Mint’s online catalog at www.catalog.usmint.gov/ and at 1-800-USA-MINT (872-6468). Hearing- and speech-impaired customers with TTY equipment may call 1-888-321-MINT (6468). The Congressional Gold Medal is one of the nation’s highest civilian awards and is bestowed by Congress as an expression of gratitude for distinguished achievements and contributions by individuals, groups, or institutions..